So far, we have seen that all molecules can potentially have weak attractions that make them cling to each other. Because the electrons in an atom or molecule are not stationary, but are always in motion, there is always a chance that a molecule will become lop-sided temporarily. Its electrons can lean a little to one side, leading to a small buildup of negative charge on that side. The molecule would be slightly low on electron density on the other side, leading to a small buildup of positive charge there. This temporary dipole can induce temporary dipoles in other molecules nearby. That slightly positive side can tug on the electrons on a molecule nearby. And so on; a chain of these events can cascade through a group of molecules. We get an induced dipole-induced dipole interaction. We have also seen that some molecules have permanent dipoles. If two atoms are bonded together and they have a sufficiently large difference in electronegativity, then there is a significant charge separation between the two atoms, and a permanent dipole results. The difference between these permanent dipoles and the ones we saw in London interactions is that the London interactions rise and fall in an instant. The London interactions typically don't last long enough to hold two molecules together very tightly, unless there are an awful lot of these interactions. Because a fixed dipole is permanent, there is little opportunity for two molecules with a dipole-dipole interaction to squirm away from each other. Hydrogen bonds are a particularly strong example of dipole-dipole interactions because of the significant electronegativity difference between oxygen and hydrogen. The interaction is also strengthened by the availability of a lone pair on oxygen to facilitate the interaction with the partial positive charge on the hydrogen. Furthermore, they are really important when you live on such a watery planet. So, these interactions get progressively stronger based on the amount of charge separation in the bond. The logical conclusion to that progression is a bond that is completley ionized. What if one end of the bond has a full negative charge and the other end has a full positive charge? Obviously, ions should have even more electrostatic attraction for each other than mere dipoles. Now, many treatments of intermolecular attractions don't even consider ionic attractions; they've got that covered under "ionic bonding". Nevertheless, it's useful to look at ionic attractions in the present context, as well, because they help to complete the picture of how two molecules might interact with each other. 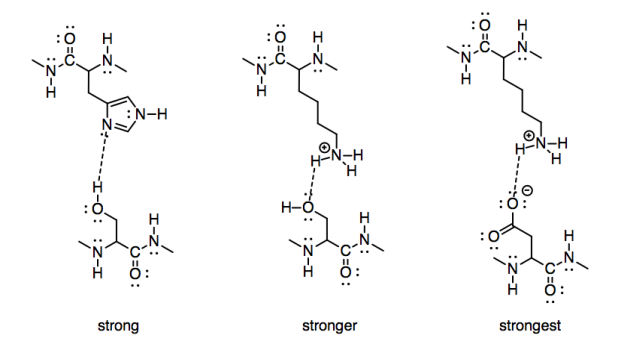 To take a biological example, we might consider the strength of interaction of two amino acid side chains. A serine and histidine would have significant interactions with each other, because both contain side chains capable of hydrogen bonding. A serine would have a stronger interaction with the side chain of a positively charged lysine, however. To go one step further, a positively charged lysine would have an even stronger attraction to a negatively charged aspartate.